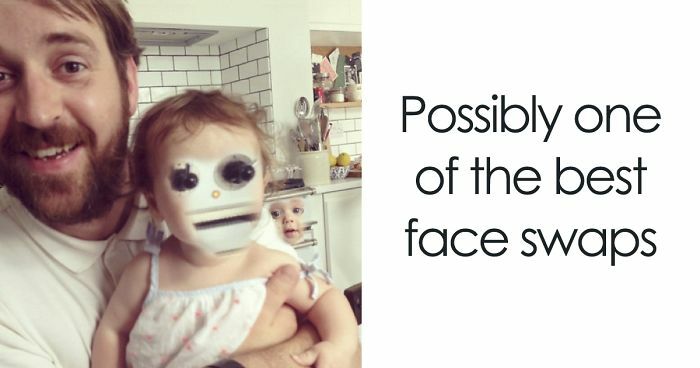 There's nothing wrong with having a 'baby face,' but these people just took it to an uncomfortable new level. Face swapping, the act of digitally rendering your face onto someone else's (and vice-versa), has slowly taken over the world since its addition to Snapchat back in 2016. People can now exchange mugs as easily as they can take selfies, and it's produced some pretty terrifying results on occasion. Nothing, however, could possibly haunt our dreams more than adult faces superimposed onto tiny infant frames. Though not all of these were made using Snapchat, each is equally bizarre in its own right, and reminds us why some people just should not be given modern technology under any circumstances. Scroll down at your own risk, and let us know if you laughed or squirmed in your seat at the end. I wouldn't want a kid with those teeths! Amazingly, the kid face on left looks perfect, kind of yelling and angry on kid to eat! I would be terrified for my life if I saw this in real! and so Santa's vicious life cycle continued, until the next time he needed a new body, he would be young and strong again. but for poor jimmy, his fate was sealed. Looks like Grandpa to me. John Oliver running away with the mic. I would be surprised af myself as well, if I see that big beard on such small kid! Even with the face swap you can see that they are both absolutely beautiful. Cthulhu appears through a portal across Time and Space. "Despair, Mortals, for I am here to consume your so..." (sees this) "... Uh... I suddenly realized that I forgot to turn off the stove... I better go back to R'lyeh... see ya..." (backs away through the portal). That baby looks like a Chinese dude expecting some martial arts. This one ended really well too, the facial expressions are great! I will never be able to un-see that piercing in this face swap! This really intrigued me, different color hairs, beard, mustache, glasses! The dad looks like Draco for some reason. Is that what newborn witches looks like? Rightly so. Looks really well. Ma'am, I think you applied too much eye makeup to your baby. This is extremely dangerous for the baby. They will now think they are older and try to run around without diapers on. It's a risk you've taken too lightly. Love the big dumb jock look that the baby faces do to the men. It's so perfect! In hands of a Rabi..
Omg. This. Is. So. CUTEE.